This past Sunday morning, we were finally able to attend worship in the village of Varin, Siem Reap Province. This church has a special place in my heart, because it is made up primarily of the first new believers that requested baptism from myself and Elder Tucker in October 2008. Since that time, we have been blessed to meet with their leader, Brother David Phean, a number of times, and have been able to assist in completing improvements to their meeting house and property as outlined in an earlier blog posting, but until this weekend we were not able to actually meet with them in the worship service. Brother Dara came up on Saturday evening and I was able to spend a few hours working with him on orphanage and administrative items. The plan was for us to go to Varin along with Sokhom’s family on Sunday morning while Rachel and the kids were going to remain at home. As it happened, Sokhom experienced more difficulties with his home improvement project and decided not to attend the services after all. With this change of plans we loaded the kids up and headed out Sunday morning. It really is not possible to adequately describe the condition of the road from Srey Nouy to Varin, but those of you who had the privilege of visiting Mark and Susan Webb when they were living in Kendalia, Texas may wish to use their road as a good place to begin imagining. The potholes, bumps and dust, combined with the pigs, dogs, motos, bicycles and toddlers traveling the common one and a half lane dirt road are a great trial of anyone’s nerves and constitution. Nevertheless, on arriving, we found the service underway with a capella singing from the Khmer hymnal. I was especially pleased to see that David introduces each hymn with a discussion of the song’s lyrics and meaning as well as related scriptural references. At the conclusion of the song service I spoke for about 1 hour (including translation) from 1 Thessalonians 5:5-24 (click here for audio). The congregation was, for the most part, quite attentive including even the youngest of children who were present in the worship. 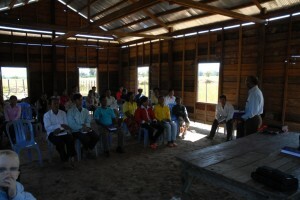 David had invited the commune and district leaders as well as the chief of police and a number of police officers. Unfortunately, with only a couple of exceptions they arrived about an hour late and missed the bulk of the preaching. They were very polite and gracious, however, and have been very helpful to David in his efforts within the community. Please continue to pray that God will bless the work in Varin and that the church will experience both spiritual and numerical growth. Current projects that Brother David is pursuing include the completion of the meeting house (concrete floor installation) and a gate for the property. He is also hoping to establish an orphanage and vocational training facilities at some later date on his property adjacent to the church house and a burial park (cemetery) in the nearby community. We will probably concentrate our Sunday morning efforts from this point forward toward meeting in our home and/or in nearby communities, so it was a blessing to share the experience with Brother David and the people of Varin Primitive Baptist Fellowship. Elder Joseph Weyel is a Pastor and Minister of the Gospel. He is originally from San Antonio, Texas, USA where he has lived until May of 2009. Joseph and Rachel were married in 1999 and have been blessed with four children born in 2000, 2001, 2002, and 2005 respectively. A second generation home educating family, each of the children is pursuing a customized course of study based upon primary source materials and traditional educational resources. Joseph began serving as pastor of Luling Primitive Baptist Church in January of 2007 during which time the Lord opened the door of ministry to Vietnam, and later to Cambodia. Elder Weyel is has also been employed as a design consultant/project manager, and estimator for CDI Technology Services (a San Antonio based Information Transport Services and Electrical contractor) since 1998. In January 2009, Joseph and Rachel committed to relocate their family to Siem Reap, Cambodia in an effort to assist in the ministry of the Word among the native Khmer Christians and to coordinate the supply of materials and finances for orphanages and humanitarian projects around Siem Reap and Kampong Thom provinces. This entry was posted in Cambodia PB Ministry. Bookmark the permalink. Just wanted to let you know that I still try to pray for you and your ministry almost every day. I am so thankful to hear good reports of how some of the churches are doing. May God guide and keep you.